Hyacinths - especially blue ones - occupy a special place in Society lore. 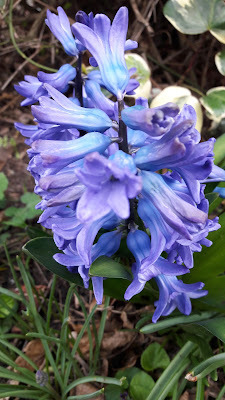 Exactly 135 years ago, on 6th May 1882, a young Janet Erskine Stuart was walking through Regent's Park and paused by a bed of hyacinths in full, fragrant bloom. In that moment, as she later said, the Word of God came to her and she "saw it all". After several years of searching for her life's purpose and meaning, this brief epiphany was a moment of searing clarity which led her, just a few months later, into the Society. What did Janet "see"? Nothing visible to any eye; nothing graspable or even comprehendible. Here instead, as the author of Hebrews says, what we have come to is nothing known to the senses... Janet's search for her purpose had begun when she was fourteen, through reading philosophy and questioning, but the answer came not through reasoning and thought but in unknowable mystery and pure, fleeting transcendence. Inevitably, such an anniversary makes me recall the moment when I, too, "saw it all", a few months after joining the Society. The catalyst was nothing as delicately pleasing as hyacinths, but a crowded, jostling street in East London: and here, in an instant, I saw, and knew, just knew, that the Heart of God was here, in the heart of the world. Just for a moment all was clear; and then I was left with what I could only describe afterwards as a strange knowing and unknowing, and an equally strange lingering joy. As far as I know, Janet rarely alluded to her "hyacinth moment" in later years, though we do know that blue hyacinths were forever special to her, as the symbol of a great revelation. But I am sure she would have revisited it, as I have mine, developing layers of depth and meaning, even in a legacy of strange unknowing. "Knowing", of course, is not what matters - that's not what the insight was given for. What matters, and what remains, is my remembrance of God's presence in an ordinary, humdrum street teeming with people; God's Heart alive and beating in the heart of our world. The Heart of God passing through the heart of the world... something not known to the senses, but very real and central to my life and call as RSCJ. And you... what have you "seen" and "known"?